After the over indulgences of Christmas and New Year I can imagine some skin care woes which need to be addressed, fatigue, stress, lack of sleep and diet all wreak havoc on our skin. 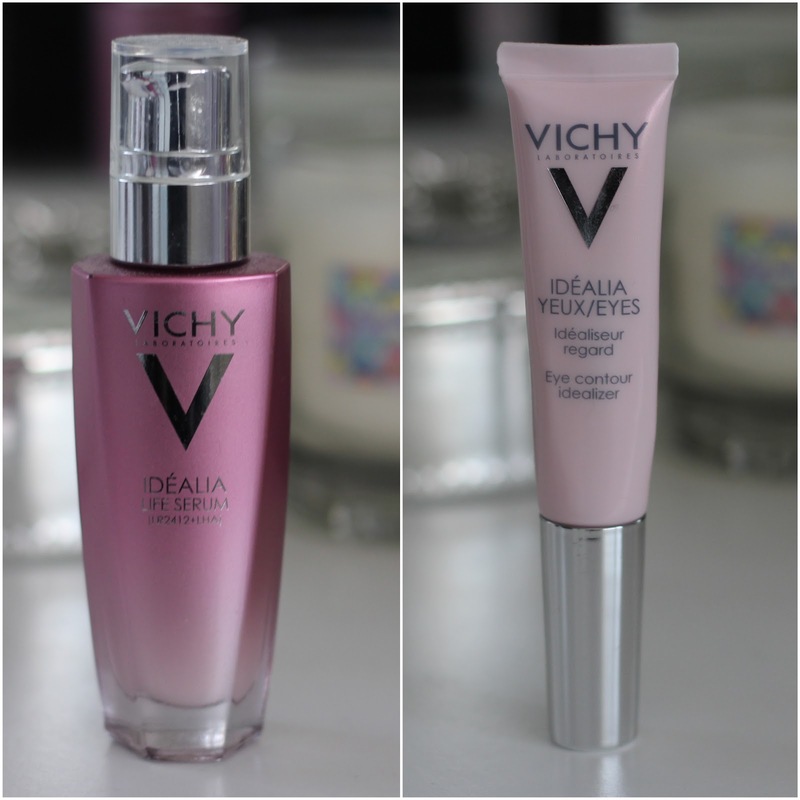 The Idélia range from Vichy are both great additions to a skin care routine lacking in a serum and an effective eye cream, I'd say it was particularly good for 20+ skins as the main focus isn't anti-aging like the majority of serums and eye creams saturating the market; Both formula's are light and easily absorbed into the skin yet very effective. Lets talk about the serum, I always recommend people use a serum in their routine and this is a great product to introduce if you've not used one before as it absorbs instantly and is incredibly light on the skin. If you are looking for a product to brighten the complexion and even out skin tone this will tick those boxes, It is definitely targeted for the mid 20's market as it's designed to correct unbalanced diets, cigarette smoke, late nights, overexposure to the sun etc and I can confirm using this makes you look fresher and can help combat some late night drinking sessions (I tested this out thoroughly!). The Eye Contour Cream I have to say I love, I often get asked to recommend an eye cream for women who haven't used one before and since using this I have recommended this every time. It's supposed to brighten the appearance of dark circles and reduce the look of fine lines; I definitely think it helps to brighten the eye but that might be because its slightly tinted pink but who cares because it works and it really moisturises and plumps up the whole eye area so your fine lines do look diminished. I have really sensitive eyes and they've loved this Eye Contour Cream, they can also get really dry at times and this product hydrates them and very quickly absorbs into the skin so I've found it the perfect base for makeup everyday. I really recommend both these products if you're looking to step up your skin care in the New Year and undo your over indulgences over the festive period without wanting to step into the anti ageing market (which is really hard to avoid these days). Both these products are on offer from Boots, £22.12 (Link) for the Life Serum and £17.25 (Link) for the Eye Contour Cream. Even at full price I think these are worth the money so with a bit of money off definitely one to get your mitts on!